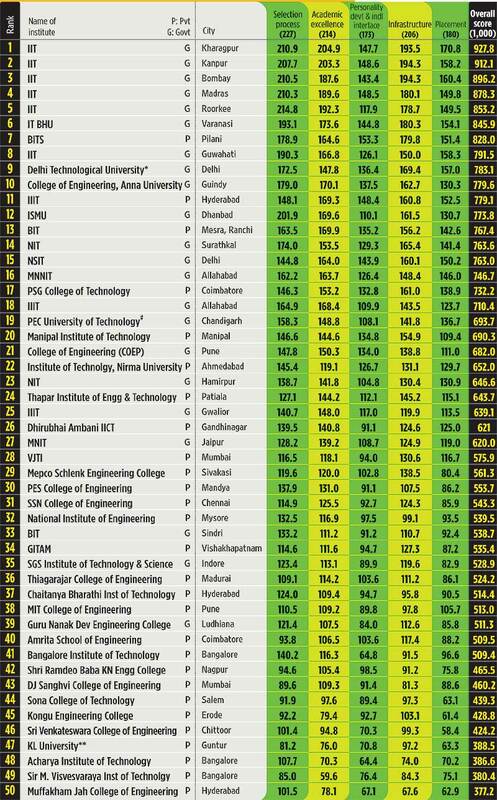 Only those institutes which submitted complete objective data on time were ranked. Some like IIT, Delhi, which did not submit complete data were not considered. NITs at Trichy, Calicut, Warangal and Rourkela; Faculty of Engg, Jadavpur University; Bengal Engg & Science University, Shibpur; VNIT Nagpur; Harcourt Butler, Kanpur; VIT, Vellore; and MANIT Bhopal did not participate. IIIT, Gwalior, offers five-year integrated course instead of BTech/BE.